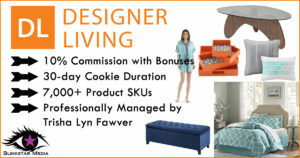 Blinkstar Media is pleased to announce that Trisha Lyn Fawver is now actively managing the Designer Living Affiliate Program. This thriving program is transitioning to Impact Radius from LinkShare. The Designer Living Affiliate Program is sure to inspire affiliates to spread the love of a well-designed home. Designer Living presents an array of brand-name home furnishings and décor items. From the modern fun of Echo Design to the coastal elegance of Harbor House to the sophistication of Natori (and everything in between), this Northern California based retailer offers style and comfort with a quality selection of comforters, sheets, furniture, duvet covers, pet beds, and more. Affiliates will have access to tools, techniques, and training to contribute to their success. Affiliates are welcome to join the Designer Living Affiliate Program in Impact Radius without delay. Due to the transition, we’re not accepting new Rakuten Affiliate Network partners at this time. Need assistance? Feel free to contact Trisha Lyn Fawver at designerliving@blinkstarmedia.com with your questions or requests.